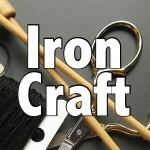 For this Iron Craft challenge we were told to get the inspiration for our project from another Iron Crafters past project. We could do it exactly the same or make it our own. 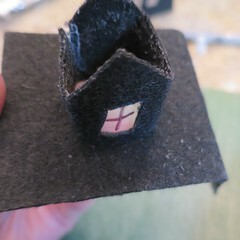 I got my inspiration from these little felt houses that were made for a challenge in 2011. I’ve always loved them and thought this would be a good opportunity to try my hand at them. 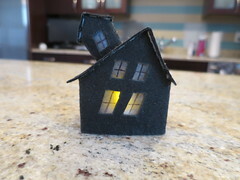 Since Halloween is approaching, I thought I’d try doing a creepy house version. I love how they turned out plus I had such a good time designing the houses and putting them together. I did them quite differently than Claire did. 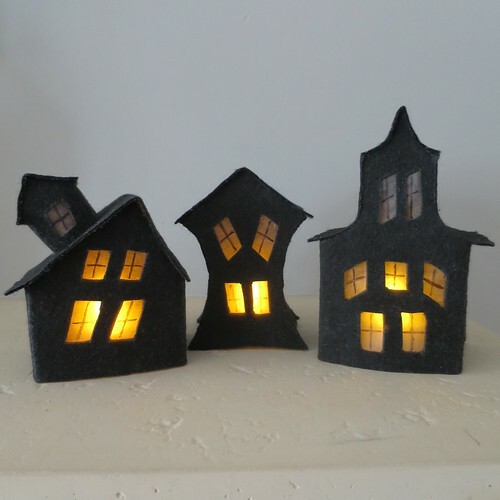 She cut a single piece of felt for each house, sewed it together and then stiffened it. My houses are a little more elaborate in shape, so they required more than one piece. 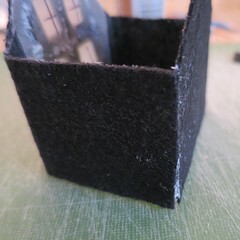 I skipped the sewing and just glued the stiffened pieces together. 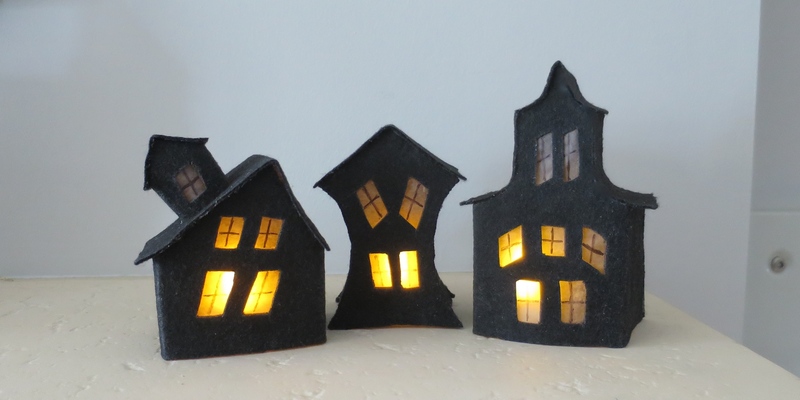 Even stiffened, the felt is pliable enough to bend and give some curve to, but the houses are surprisingly sturdy once assembled and dry. 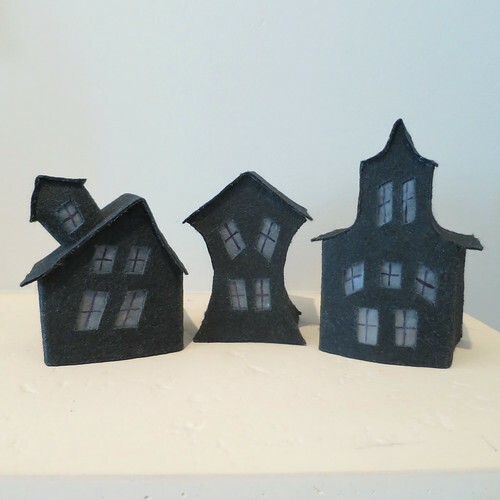 Download a pdf of the Creepy House Templates. The finished houses are different heights but the tallest is just over 4″. 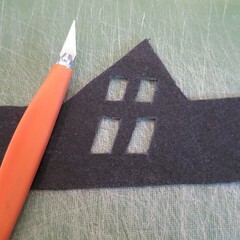 *You can also buy pre-stiffened felt and skip the whole stiffening step. I have not tried it so I can’t speak for how good this felt is. 1. Print and cut out the house templates you will be using. Make sure to keep the pieces for the different houses separate. 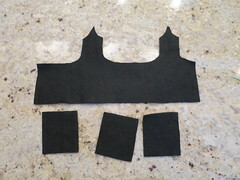 Use those pieces to cut out the needed parts from the black felt. I like to print my template out on card stock. 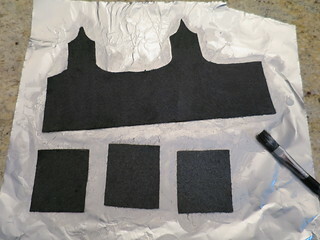 Then I use glue stick to adhere the pieces to the felt and cut around them. 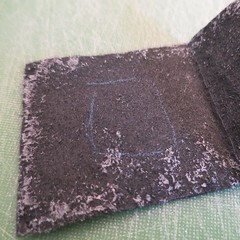 The pattern peels right of the felt and can be reused. You could also print them out on paper and just pin them to the felt. 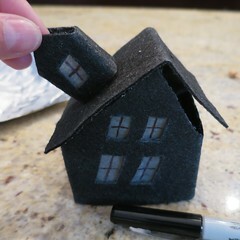 Don’t worry if your pieces aren’t exact, you want the houses to be a little wonky. 2. 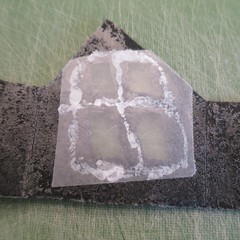 Put the pieces on a piece of wax paper (or tin foil or plastic wrap). Saturate with fabric stiffener. I like to use a paintbrush to do this. I put it on one side, flip the piece over and add more. 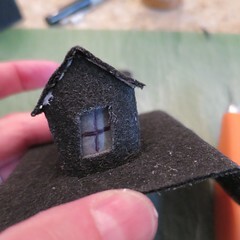 The side facing the wax paper will have a bit of a glue film on it and be the inside of the houses. Let dry. If the pieces are not stiff enough after drying paint on another coat. (I almost always need to do this.) 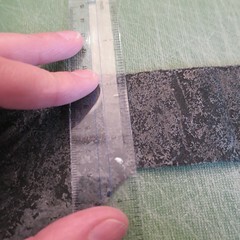 The dried pieces can be peeled off the wax paper. 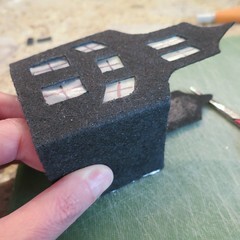 From this point, I will show all the details as I assemble the Dormer House (it is the easiest of the three) then I will give you the steps for the other two houses. 3. 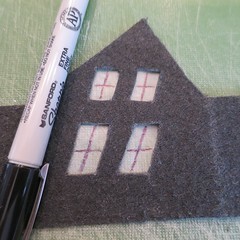 On the front section of the house piece, draw on the windows with the dressmakers pencil, then carefully cut them out with an exacto knife. Remember this is supposed to be a creepy old house, so the windows don’t need to be aligned, square or straight. Cut a piece of wax paper big enough to cover the windows. Glue to the back behind the windows. 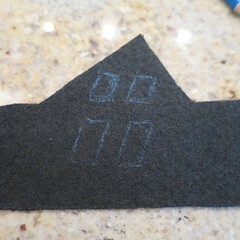 Use a Sharpie to add panes to the front of the windows. Do the same thing on the dormer piece. 4. 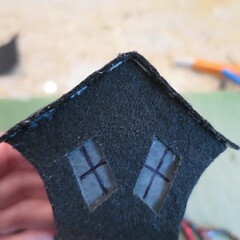 On the back of the house piece, use a ruler and exacto knife to score the lines where the house will fold. You are not cutting all the way through just a little bit to help with the folds. Fold along those lines. Glue into a square with the tacky glue. It helps to hold it together until the glue sticks. Do the same thing with the dormer piece. 5. Score and fold the roof to the house. Figure out where you want the dormer to sit on the roof. 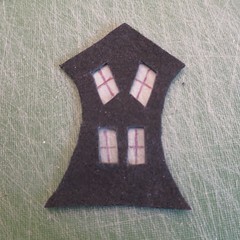 Trace around the base of the dormer with the dressmakers pencil. Cut that area out of the roof just inside the lines you drew. Slide the dormer in the hole and glue into place. 6. Score and fold the dormer roof. Glue into place. Glue the house roof into place. 7. Set on top of tea light to light. 3. Cut the windows out of the front piece and add wax paper as above. 4. 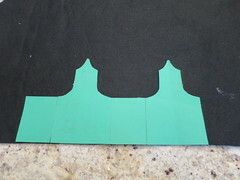 Bend the side pieces into a curve that matches the sides of the house. Lay the front piece of the house face down and glue the sides in place, just on the inside of the front piece. These you really do have to hold until they are stuck. 5. Glue the back in place. 6. Score and fold the roof. Glue into place. 3. Add windows to the front section as on the other houses. 4. Score and fold the house piece. Glue into a square. 5. Curve the side pieces so they fit up the side of the steeple. Glue both sides to the front piece. This time your side piece will glue to the side of the front (and back pieces). I found it helped to hold them at the curve. Really make sure they are stuck in place and then glue to the back. 6. Score and fold the roof piece. Curve the sides. 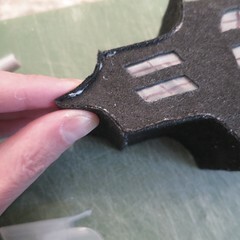 Glue into place pushing in with your fingers to fit the curve. 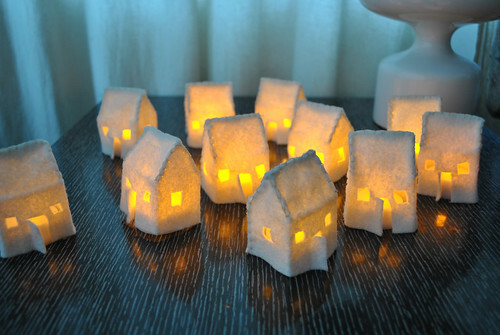 Yes, you could make these from card stock. 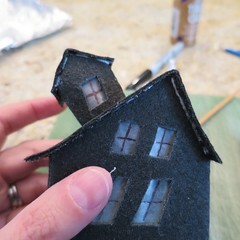 I would add a tab where the sides of the houses attached so you have a way to glue them together as paper is thinner than felt. 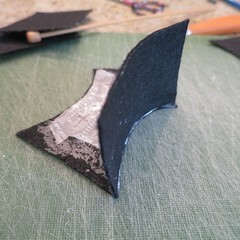 I liked the body and stiffness the stiffened felt has. I think it would be fun to add a ghost or two to some of the windows. I might also make a small creepy tree to sit out front. 5 years ago by Kat in Challenges , Craft Projects , Crafts , Halloween , Holiday , Iron Craft , Projects | You can follow any responses to this entry through the RSS feed. You can leave a response, or trackback from your own site. thank you for these houses. i will make some for halloween. Pingback: DIY Halloween Decoration Ideas - 25 budget friendly ideas!